Below listed items can be used with this product. Select the items that you wish to add and enter the desired quantity in the box at the left . 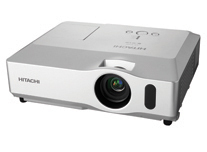 Hitachi CP-X200 3LCD projector features a brightness of 2,200 ANSI lumens and a 500:1 contrast ratio, at a light weight of 7.7 pounds. Hitachi CP-X200 also features Hitachi?s exclusive Input Source Naming function, allowing users to customize the names of their individual input sources. Other proprietary features include My Screen/My Memory preset options and a remote control with My Buttons. Hitachi CP-X200 is equipped with a security bar, Kensington security slot and transition detector (a sensor located inside the projector that recognizes when the projector has been moved). Additionally, Hitachi CP-X200 is protected against unauthorized operation with its PIN code security system. Hitachi CP-X200 offers customizable resolution, allowing presenters the ability to automatically resize special resolutions or undetectable wide size resolution images and set to the best position on the screen, creating a near-perfect image ever time. Additionally, Hitachi CP-X200 has 7-watt audio out, as well as a high-performance side-mounted filter for easy maintenance.